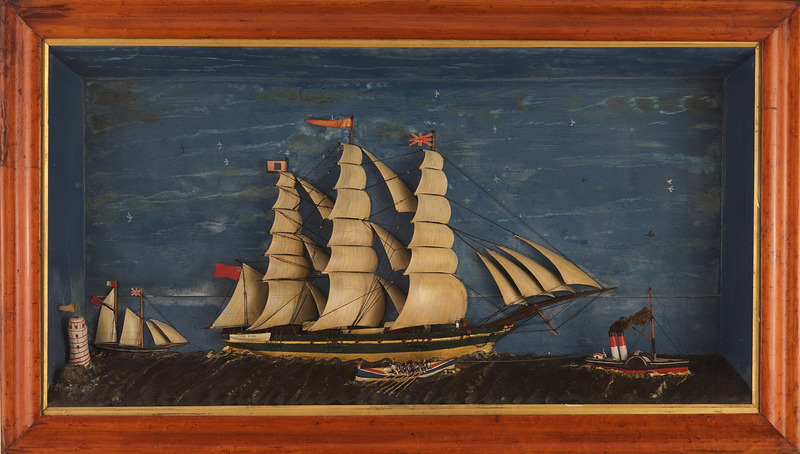 A fine and large sailor-made diorama of carved and painted wood with a painted modeled sea and a charming painted wood background with sea birds and clouds. The surrounding bolection molding in bird's eye maple veneer. This diorama records an incident involving the 19th century barque 'Storm King'. Before her is a crewed lifeboat and a paddle-steamer tug in assistance, another small sail ship on the horizon passing a headland with lighthouse. English circa 1870.